NEW YORK (AP) — Not to be outdone by the other heavyweight titleholder, Deontay Wilder showed he can be a champion at trash talk, too. The WBC heavyweight title rematch between champion Deontay Wilder and Tyson Fury is off for now. Fury somehow gathered his wits, rose and made it to the final bell. That's when both hulking men heard a verdict that didn't satisfy them, but nearly guaranteed a rematch of this exciting showdown. LOS ANGELES (AP) — The sun shines on Tyson Fury every morning in California. The larger-than-life heavyweight from Manchester has found comfort and calm far from home. Whether training in the high-altitude seclusion of Big Bear or sampling Los Angeles' good life at a Lakers game, Fury believes he has found the proper place to start again. Just how well Deontay Wilder's heavyweight title defense Saturday night against Tyson Fury in Los Angeles will do at the box office is a question mark. For all the power in his right hand, Wilder is still trying to build his brand and Fury is largely an enigma in the U.S.
What it means for boxing's most prestigious division, though, is easy to quantify. LOS ANGELES (AP) — Heavyweights Deontay Wilder and Tyson Fury have wrapped up their three-city publicity tour for their upcoming bout by nearly coming to blows again. The unbeaten stars' news conference in downtown Los Angeles on Wednesday got physical when Wilder and Fury exchanged shoves after pushing their heads together during some nose-to-nose trash talk. LONDON (AP) — No sooner had Anthony Joshua brutally dispatched another pretender to his heavyweight titles than attention turned to who the British fighter would face next as he seeks to clean up boxing's most glamorous division. An eagerly anticipated fight on Dec. 1 will go a long way to clearing that up. This was supposed to be the week Anthony Joshua completed his whirlwind boxing journey from Olympic gold medalist to undisputed world heavyweight champion. Deontay Wilder should have been the opponent, Las Vegas potentially the venue. There was talk of $50 million being on the table. Instead, Joshua has to take a detour. The 28-year-old Briton was back home in London on Thursday, ready to fulfil his mandatory obligations by facing Russian fighter Alexander Povetkin at Wembley Stadium. LONDON (AP) — Anthony Joshua was ordered to sign a deal to fight Alexander Povetkin "within 24 hours" or face being stripped of the WBA portion of his world heavyweight boxing titles. The WBA lost patience with the talks between Joshua and WBC champion Deontay Wilder for a unification bout, and want Joshua to fight its mandatory challenger from Russia. TUSCALOOSA, Ala. (AP) — Jay Deas understands the value of a passionate hobby. The Tuscaloosa native-turned-boxing trainer has seen it firsthand. A little over a decade ago, Deas met a 20-year-old who walked into his gym looking for a boxing trainer. A few years later, that tall, physical young man, Deontay Wilder, became the World Boxing Council's heavyweight boxing champion. Could the next big thing in boxing be here in Decatur? "You never know," Deas said. "That person could be right here." 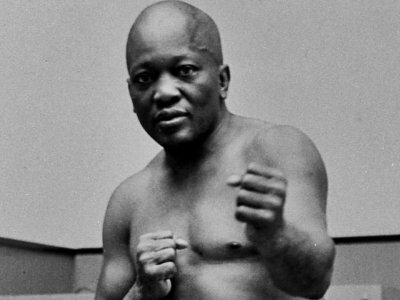 WASHINGTON (AP) — President Donald Trump has granted a rare posthumous pardon to boxing's first black heavyweight champion, clearing Jack Johnson's name more than 100 years after what many see as his racially charged conviction. NEW YORK (AP) — Jarrell Miller remained unbeaten and made his case for a potential shot at heavyweight champion Anthony Joshua by winning a unanimous decision against Johann Duhaupas on Saturday night. The 304-pound "Big Baby" won 119-109 on two judges' cards and 117-111 on the other. He improved to 21-0-1 in just his fourth fight that didn't end in a stoppage. MANCHESTER, England (AP) — Overweight, unhappy and in semi-retirement amid a doping ban, Tyson Fury was walking his dog beside a canal near his home when he thought about what fellow heavyweight boxer Deontay Wilder was saying about him. "He said, 'Tyson Fury, he's done,'" Fury recalled. "I thought, 'You know what, I'm a fat pig. Look at the state of me.' I felt like jumping in the water and drowning. "Then I thought, 'I'm going to turn this around and knock him out.'" TALLADEGA — It's race week at Talladega Superspeedway, and there should be plenty to see. They'll have three races, including Friday's ARCA General Tire 200 at 5 p.m., Saturday's Xfinity Series Sparks Energy 300 at 2 p.m. and Sunday's GEICO 500 at 1 p.m. The speedway is planning a Saturday concert, and the headliner is Uncle Kracker. CARDIFF, Wales (AP) — Deep in the bowels of Cardiff's Principality Stadium, Anthony Joshua sat with his four world heavyweight belts in front of him and called on Deontay Wilder to get serious about negotiations for a unification fight. Across the Atlantic, Wilder was posting a video on Twitter minutes later, shouting into his phone: "Joshua? Joshua? Stop playing, and pick up the phone!" Team Joshua wants it. Team Wilder wants it. The boxing world and beyond wants it. Anthony Joshua beat Joseph Parker by unanimous decision to become a three-belt world heavyweight champion. He delivered the first loss of the New Zealander's career on Saturday. Joshua was taken the distance for the first time in his 21-fight professional career, having won his other 20 by knockout. Two judges awarded the fight to Joshua 118-110. The other had it 119-109. SHEFFIELD, England (AP) — If 2017 for Anthony Joshua was about becoming the world's No. 1 heavyweight, 2018 is all about creating his legacy. "No one is on the journey anymore," Joshua said Wednesday. "We're at the destination." Bold words for someone with just 20 professional fights to his name. Then again, Joshua is no normal boxer. NEW YORK (AP) — There they stood, champions holding their belts, challengers longing to take them away. From WBC world heavyweight champ Deontay Wilder to WBA featherweight title holder Leo Santa Cruz, the stage at a midtown restaurant was overflowing with tough guys and testosterone. Showtime announced its boxing cards through mid-June on Wednesday, a schedule that includes four matchups of top-five ranked fighters, and 12 world champions. Eleven world title bouts are ahead. MOSCOW (AP) — Russian boxer Alexander Povetkin has had his indefinite doping suspension from the WBC cut to one year, but he still must pay a $250,000 fine. Povetkin had two WBC fights called off last year after positive doping tests, including a planned heavyweight title bout against Deontay Wilder. The Russian was banned from WBC-sanctioned fights after the second failed test, but he appealed. NEW YORK (AP) — Deontay Wilder is steamed. And drained. And very, very eager. All of those descriptions are delivered by the WBC heavyweight champion himself as he prepares to fight Bermane Stiverne on Saturday night at Barclays Center. Anthony Joshua has big plans for 2018 now that he is the biggest draw in heavyweight boxing. A unification fight against Deontay Wilder or Joseph Parker. A first fight in the United States, or maybe Africa or the Middle East. Even an all-British super-fight against Tyson Fury, if the former champion regains his license. MONTGOMERY, Ala. (AP) — Heavyweight boxing champion Deontay Wilder was charged Wednesday with misdemeanor marijuana possession, but his lawyer says the marijuana found in his car did not belong to him. MOSCOW (AP) — Russian heavyweight Alexander Povetkin has been suspended indefinitely and fined $250,000 by the World Boxing Council in a doping case. Povetkin tested positive for the banned muscle-builder ostarine ahead of his interim world title bout against Bermane Stiverne in December. The fight was canceled. The suspension applies only to bouts sanctioned by the WBC. Povetkin can ask for it to be lifted after one year if he repeatedly tests negative for banned substances in that time. BIRMINGHAM, Ala. (AP) — Deontay Wilder has taken the first step toward claiming another heavyweight title belt by year's end. Now, all the WBC champion can do is wait and hope for a much more high-profile fight than he's had lately. BIRMINGHAM, Ala. (AP) — Deontay Wilder proved his surgically repaired right hand is still a devastating force — once he unleashed it. MONTGOMERY, Ala. (AP) — A minor league baseball team in Alabama is being sold. The Montgomery Biscuits will be sold to a new ownership group headed by boxing promoter-television producer Lou DiBella, the Montgomery Advertiser (http://on.mgmadv.com/2l4GXTE) reported. Team owner Sherrie Meyers and city official made the announcement Thursday at Riverwalk Stadium. BIRMINGHAM, Ala. (AP) — Deontay Wilder is trying to emulate Larry Holmes, both in becoming the world's dominant heavyweight champion and in cultivating a pinpoint left jab while sidelined by a right hand injury. Deontay Wilder was in the Super Bowl media center in Houston a few days before the game when a somewhat familiar face walked by. Wilder and his girlfriend recognized Andrew Zimmern, who stars in the "Bizarre Foods" show on the Travel Channel. More telling, perhaps, was that Zimmern recognized him. "I'm a big fan, champ," Zimmern said before engaging Wilder in a friendly chat and posing for pictures with the heavyweight champion. MONTGOMERY, Ala. (AP) — Deontay Wilder wants more of a crackdown on cheating "before it ruins the sport of boxing." The unbeaten WBC heavyweight champion's last two fights have come after his original opponents — Alexander Povetkin and Andrzej Wawrzyk — tested positive for banned substances. NEW YORK (AP) — In a unanimous court decision, U.S. heavyweight boxer Deontay Wilder won his latest fight Monday. A Manhattan federal jury deliberated a half hour before finding in his favor in a civil action in which the World Boxing Council champion seeks $5 million for a fight that never happened against a Russian heavyweight challenger. NEW YORK (AP) — Two heavyweight boxers squared off without throwing a punch Tuesday, as an American champion accused a Russian fighter of using a performance-enhancing substance implicated in his country's larger doping scandal and the ban on tennis star Maria Sharapova. BIRMINGHAM, Ala. (AP) — WBC heavyweight champion Deontay Wilder is set to fight unbeaten contender Gerald Washington on February 25 at Legacy Arena. Washington replaces Wilder's original opponent Andrzej Wawrzyk, who tested positive for a banned substance. BIRMINGHAM, Ala. (AP) — WBC heavyweight champion Deontay Wilder is scheduled to return to the ring against Polish challenger Andrzej Wawrzyk. The matchup, announced on Wednesday, is set for Feb. 25 at Legacy Arena. Wilder hasn't fought since sustaining a broken right hand and torn bicep in a win over Chris Arreola in July. That fight was stopped after the eighth round. MOSCOW (AP) — World Boxing Council president Mauricio Sulaiman says Alexander Povetkin has failed a doping test and sanctioning for the Russian heavyweight's title bout against Bermane Stiverne has been withdrawn. Povetkin had been due to take on Stiverne for the WBC interim world title Saturday in Russia but the fight has now been called off. MANCHESTER, England (AP) — Anthony Joshua will make the second defense of his IBF world heavyweight title in a fight against American challenger Eric Molina on Dec. 10. Joshua's promoters announced the fight on Tuesday. It will take place at the Manchester Arena in northern England, a rare fight outside London for the unbeaten British boxer. MEXICO CITY (AP) — The WBC has decided not to ban Russian heavyweight title contender Alexander Povetkin after he tested positive for the banned substance meldonium, and has ordered him to fight Canada's Bermane Stiverne for an interim title. Povetkin was due to face WBC heavyweight champion Deontay Wilder of the United States in May before it was revealed he had failed a drug test in the build-up. RIO DE JANEIRO (AP) — Nico Hernandez had a gnarly gash over his left eye that left him bloodied, with blurred vision and in need of stitches. He has a better look in mind for Sunday. Hernandez will leave the Rio Games with a bronze medal in the light flyweight division, ending a medal drought for the U.S. that stretched to 2008. He's also the first American light flyweight to medal since Michael Carbajal won silver in 1988. BIRMINGHAM, Ala. - Despite fighting mostly one-armed for half the fight, Deontay Wilder easily defeated Riverside's Chris Arreola to retain his WBC heavyweight title Saturday night at Legacy Arena. Wilder, who had a damaged right biceps and a broken right hand, quickly headed to the hospital after defending his title with a technical knockout. Arreola's corner stopped the fight after the eighth round. BIRMINGHAM, Ala. (AP) — Despite fighting mostly one-armed for half the fight, Deontay Wilder remained in control in the ring before quickly heading to the hospital. Wilder retained his WBC heavyweight title with a technical knockout when Chris Arreola's corner stopped the fight after the eighth round Saturday night at Legacy Arena. BIRMINGHAM, Ala. (AP) — Deontay Wilder sported a three-piece suit, bow tie and shades to the pre-fight news conference. Chris Arreola wore T-shirt, jean shorts and a chip on his shoulder.